Lung transplant for cystic fibrosis has been considered contraindicated in patients who have Burkholderia Cenocepacia infection. A 24-year-old white woman who had cystic fibrosis presented with respiratory failure caused by B. Cenocepacia pneumonia. She was treated with broad-spectrum antibiotics and a double-lung transplant. The chest cavity and both bronchi were irrigated with 0.5% povidone-iodine solution. For immunosuppression, she received induction therapy with alemtuzumab (15 mg) and methylprednisolone and maintenance therapy with tacrolimus, mycophenolate mofetil, and prednisone (5 mg daily). Postoperative antibiotics included intravenous meropenem for 3 weeks; vancomycin for 10 days; and inhaled ceftazidime, oral trimethoprim-sulfamethoxazole, and doxycycline for several months. 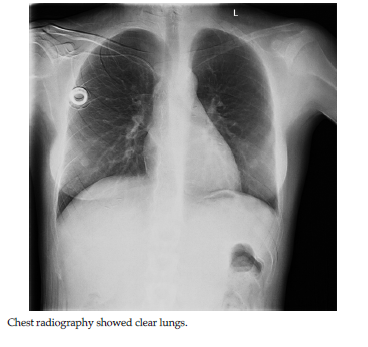 Follow-up at 25 months after transplant showed that chest radiographs were clear and lung function was normal. At 6 years after transplant, she was working full time and had no recurrence of infection from B. Cenocepacia. This case suggests that patients who have cystic fibrosis and active B. Cenocepacia pneumonia may be successfully treated with a lung transplant. Lung transplant is the final therapeutic option for end-stage lung disease in patients affected by cystic fibrosis. Preoperative active pneumonia with a variety of highly resistant pathogens and pre-operative mechanical ventilation are often con-sidered contraindications for lung transplant because of poor outcomes. Lung transplant has been considered contraindicated in cystic fibrosis patients who have colonization or infection with Burkholderia Cenocepacia because of lower survival than patients infected with other cystic fibrosis pathogens.1-3 Recent studies have shown that the strain of Burkholderia affects survival after lung transplant.4-7 The Burkholderia Cepacia complex contains 9 different species with varied aggressiveness of strains.8,9 Genomovar III (B. Cenocepacia) is an aggressive bacterium that has been associated with worse outcome after lung transplant.2,4,7,9,10 We treated a patient who had double-lung transplant for cystic fibrosis and who had active B. Cenocepacia pneumonia. A 24-year-old white woman (body weight, 55 kg; height, 165 cm) who had cystic fibrosis developed worsening dyspnea. Her medical history included pancreatic insufficiency, bronchiectasis, cor pulmonale, and mild malnutrition. Previous sputum cultures had shown B. Cenocepacia repeatedly and methicillin-resistant Staphylococcus Aureus and Pseudomonas Aeruginosa intermittently. She presented to another hospital with worsening cough and hemoptysis, and this was the third time that she received inpatient care for cough and hemoptysis. She underwent successful embolization of the right bronchial artery. However, she developed increased hypercapnia (maximum arterial partial pressure of carbon dioxide [PaCO2], 120 mm Hg), decreased oxygen saturation, and altered mental status. She required urgent intubation and was transferred to our hospital 6 days after presentation. On admission to our hospital, she had fever (38oC), and chest radiography showed extensive bilateral infiltrates (Figure 1). White blood cell count was 30.9 × 109/L. She was treated with broad-spectrum antibiotics and assist-control ventilation with 55% fraction of inspired oxygen. She was kept active on the lung transplant waiting list because of her young age and the possibility that she might not recover from this aggressive B. Cenocepacia pneumonia. She had repeated sputum and blood cultures positive for B. Cenocepacia. The lung allocation score was 74.7. The day after admission to our hospital, a donor became available and she underwent a double-lung transplant using a minimally invasive approach.11 The donor was a 19-year-old female (body weight, 48 kg; height, 163 cm) who died of bacterial meningitis from Neisseria meningitidis. During lung transplant, the patient had moderate pulmonary hypertension (systolic pulmonary arterial pressure, 50-60 mm Hg). She did not tolerate double-lung ventilation because of active pneumonia. She was placed on cardiopulmonary bypass because the intraoperative PaCO2 was 229 mm Hg, arterial partial pressure of oxygen was 113 mm Hg, and pH was 6.85. There were severe adhesions in the pleural space bilaterally. The chest cavity and both bronchi were irrigated with 0.5% povidone-iodine solution. The ischemic time for the right and left lungs were 426 and 519 minutes, and total cardiopulmonary bypass time was 322 minutes. After surgery, the patient did well. She was extubated on the second postoperative day, transferred to the ward on the seventh postoperative day, and discharged on the eighteenth postoperative day. Postoperative chest radiographs showed clear lung fields and normal pulmonary vasculature. For immunosuppression, she received induction therapy with alemtuzumab (15 mg) and methylprednisolone (0.5 mg/kg/d) and maintenance therapy with tacrolimus, mycophenolate mofetil, and prednisone (5 mg/d). Postoperative antibiotics were based on several in vitro antibiotic susceptibility tests and included intravenous meropenem (40 mg/kg every 8 h) for 3 weeks; vancomycin (20 mg/kg every 8 h) for 10 days; and inhaled ceftazidime (15 mg/kg every 3 h), oral trimethoprim-sulfamethoxazole (160 mg and 800 mg tid), and doxycycline (100 mg bid) for several months. 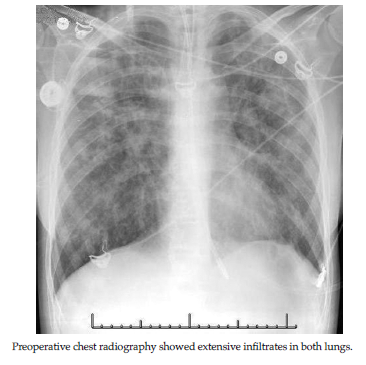 Follow-up at 17 and 25 months after transplant showed that chest radiographs were clear (Figure 2) and she had normal lung function including forced vital capacity 3.56 L (89% predicted), forced expiratory volume in the first second of expiration 3.31 L (103% predicted), and forced expiratory flow (midexpiratory phase) 3.56 L/min (160% predicted). At 6 years after transplant, she was working full time; she had no recurrence of infection from B. Cenocepacia, but she had Pseudomonas aeruginosa noted on several respiratory cultures after transplant. This patient had 3 contraindications for lung transplant, including B. Cenocepacia infection, active pneumonia, and invasive mechanical ventilation. Despite these adverse circumstances, lung transplant was successful. The outcome may have been improved because of several factors including (1) susceptibility of the strain of B. Cenocepacia; (2) irrigation of the chest cavity and airway with povidone-iodine solution; (3) use of lymphocyte depletion with alemtuzumab at transplant and concomitant corticosteroids at a low dose that may have minimized the adverse effects of steroids on neutrophil function; and (4) use of inhaled ceftazidime to minimize allograft contamination with B. Cenocepacia from the sinuses and trachea. Infection with any species of B. Cepacia may no longer be considered an absolute contraindication to lung transplant. Barlow CW, Robbins RC, Moon MR, Akindipe O, Theodore J, Reitz BA. Heart-lung versus double-lung transplantation for suppurative lung disease. J Thorac Cardiovasc Surg. 2000;119(3):466-476. Aris RM, Routh JC, LiPuma JJ, Heath DG, Gilligan PH. Lung transplantation for cystic fibrosis patients with Burkholderia cepacia complex. Survival linked to genomovar type. Am J Respir Crit Care Med. 2001;164(11):2102-2106. Chaparro C, Maurer J, Gutierrez C, et al. Infection with Burkholderia cepacia in cystic fibrosis: outcome following lung transplantation. Am J Respir Crit Care Med. 2001;163(1):43-48. Alexander BD, Petzold EW, Reller LB, et al. Survival after lung transplantation of cystic fibrosis patients infected with Burkholderia cepacia complex. Am J Transplant. 2008;8(5):1025-1030. Corris PA. Lung transplantation for cystic fibrosis. Curr Opin Organ Transplant. 2008;13(5):484-488. Hopkins PM, Kidd TJ, Coulter C, Feather IH, Derrington P, Bell SC. Death after lung transplantation in cystic fibrosis patients infected with Burkholderia cepacia. Am J Respir Crit Care Med. 2009;179(3):257-258. Murray S, Charbeneau J, Marshall BC, LiPuma JJ. Impact of burkholderia infection on lung transplantation in cystic fibrosis. Am J Respir Crit Care Med. 2008;178(4):363-371. Lipuma JJ. Update on the Burkholderia cepacia complex. Curr Opin Pulm Med. 2005;11(6):528-533. De Soyza A, Corris PA. Lung transplantation and the Burkholderia cepacia complex. J Heart Lung Transplant. 2003;22(9):954-958. Boussaud V, Guillemain R, Grenet D, et al. Clinical outcome following lung transplantation in patients with cystic fibrosis colonised with Burkholderia cepacia complex: results from two French centres. Thorax. 2008;63(8):732-737. Toyoda Y. A minimally invasive incision for lung transplantation: antero-axillary approach. Kardiochirurgia i Torakochirurgia Polska. 2007;4(4):408-410.